Thank you SQB-SMA, it's nice to talk to someone who can remain on topic and has a solid understanding of the situation at hand. 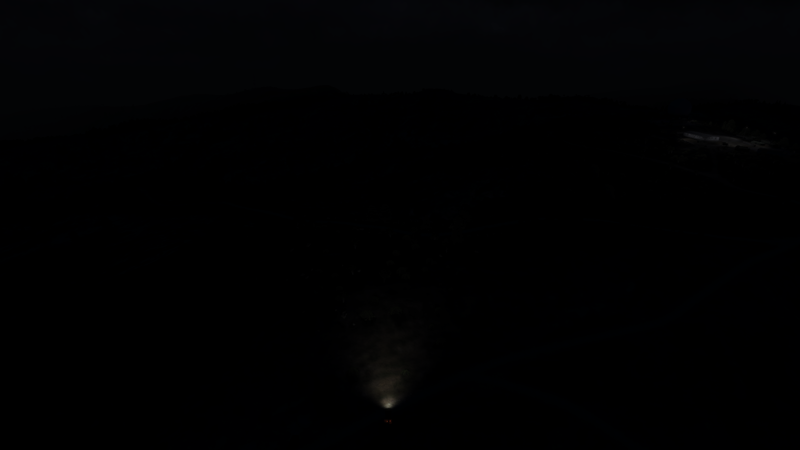 I have done several tests toggling the Dynamic Lights settings (hahahaha oh wait, you sure you want to continue telling me they're not dynamic lights, thecapulet, when the freaking game itself calls them dynamic lights.... *facepalm*) on Ultra and on Low and either way I see exactly what you see in my dev build night screenshots. 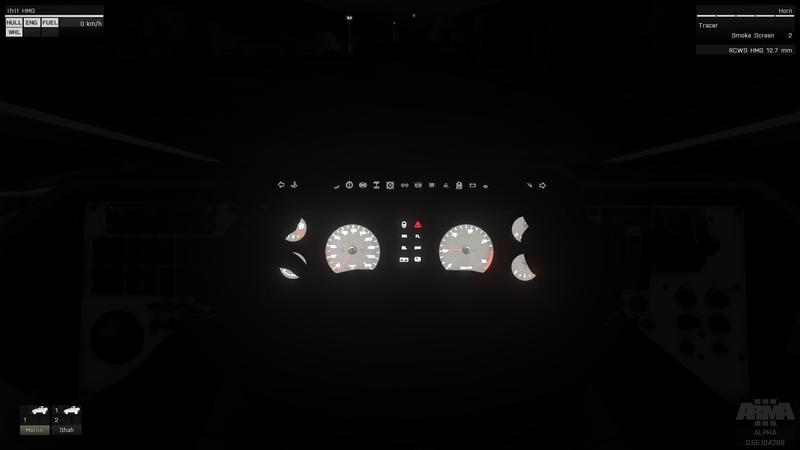 No lights coming from structures, and player controlled dynamic lights such as flashlights and vehicle headlights are substantially darker than they should be. This is also visible on the compass and wristwatch glow. Can you post some screenshots of the airport from approx 200m away at night? Along with a screenshot of your time of day settings? That's the window you get which allows you to manually configure the weather and hour. Also make sure you set it to full overcast 100% to get consistent results to what I posted in my previous screencaps. Update: just saw your edit, yeah I knew something had to be up. I'm playing mod-less right now totally vanilla dev build and my game files are verified. Can you link me to what mods you're running so I can test them on my end and see what's going on? thecapulet thinks dynamic light has something to do with casting shadows. another victim of valve's forceful marketing techniques, making everyone think that the dynamic shadow casting in their source engine is the only true representation of "dynamic lighting"
Guys could you please take your discussion to another thread? LetÂ´s keep this one for communicating with the Devs. They wonÂ´t bother reading it any longer if it is full of such discussions. Latest DEV says - Dedicated Server (Windows) executable to a small group of server admins. It does not require Steam Client running. Why would you be taking out steam ? Is this anything to do with optimization. I think they just want to let people know that the dedi server is coming soonâ„¢. It will make server admins' lives a whole lot easier. Isn't that also connected with the HC? sounds like a breakthrough :-). I remember your excellent thread about this old issue. This is not so much to do with Steamworks functionality, but rather with allowing serious server admins to run servers without running the Steam Client (more practical). It would also allow you to run a server and connect to it on the same PC if I'm not mistaken, which is convenient for MP scenario designers. It's the stepping stone to an entirely separate DS package in the future. Such servers do not need nor will they have all rendering technologies, high-resolution assets, etc. - it is a console only. 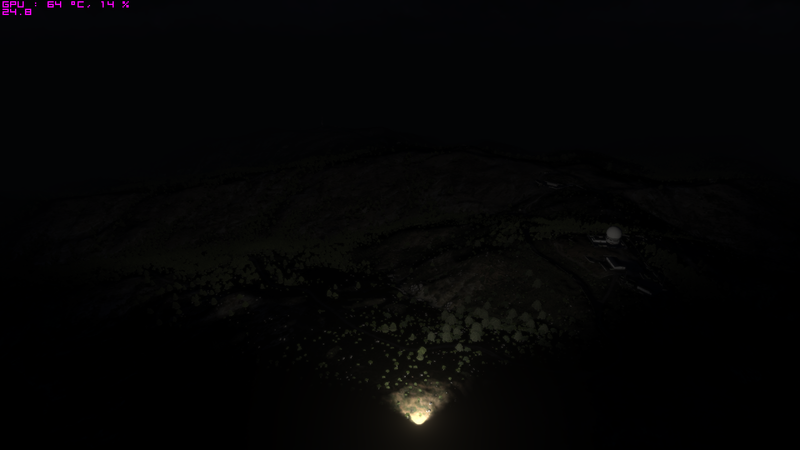 Light sources seem to be very bright now, at least with AiA-mod and Chernarus. Fireplaces cause dense orange glow with ~100 radius and its very bright everywhere. 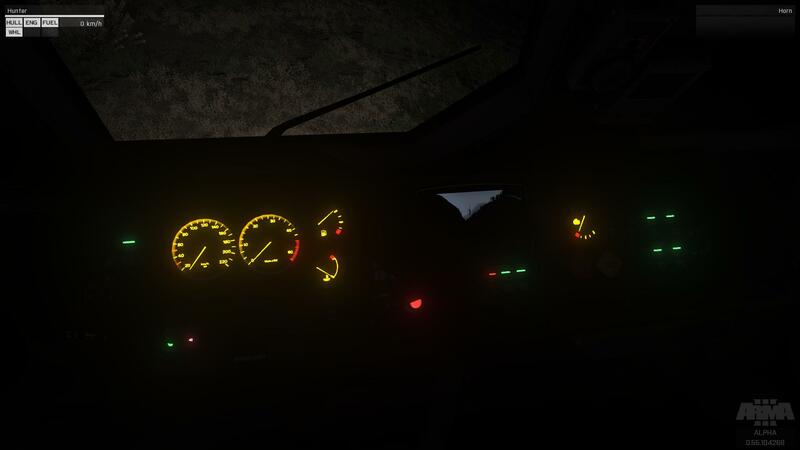 I think, vehicles headlights could be stronger, and what about the flashlights? Are they strong enough now? Looks definitely normal, also the stars. Maybe there was some NVGoggles related bug for me, with the AiA-mod. Havent yet tried without it. Based on your screenshots as well as comments from DNA, I am really worried about the changes they made, more so than ever. DNA mentioned that materials will need to be updated to adjust to the new code. This broke lighting and materials in Chernarus, which until the 4/17 dev build worked perfectly fine. Stratis, and all the night time lights/materials were also perfectly fine. "If it ain't broke don't fix it." Please stop talking about Chernarus. This has NOTHING to do with Arma3. It just so happens to 'work' but this is not the main thrust of the development or should it be. I'm not bothered if any previous islands work, as i believe the original authors should work on porting them, rather than talented others cobbling together a fix. 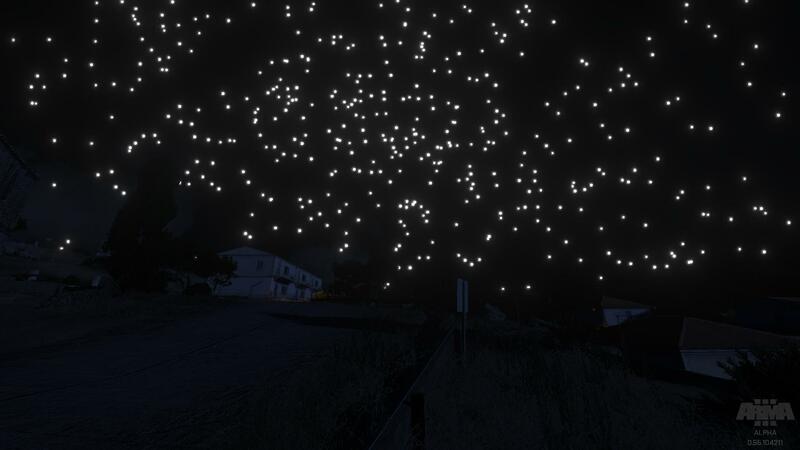 Well I agree its a mod, but still very big part of ArmA3. 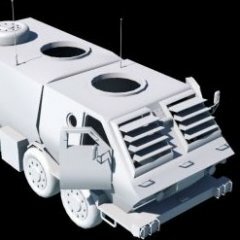 People want to convert and play content from ArmA2 with new tech. I thought it would have been worth of mentioning incase there would be some easy solution. Nobody cares about Chernarus, the point of mentioning Chernarus is that everything was golden and then they started tweaking the HDR/lighting code and now everything is FUBAR, including Stratis. I could care less if Chernarus is busted, it's Stratis being busted that hurts the most and the same reasons Stratis is broken is the same reasons Chernarus is broken. While these might be resulting from WIP changes, nighttime is seriously broken in the last builds. 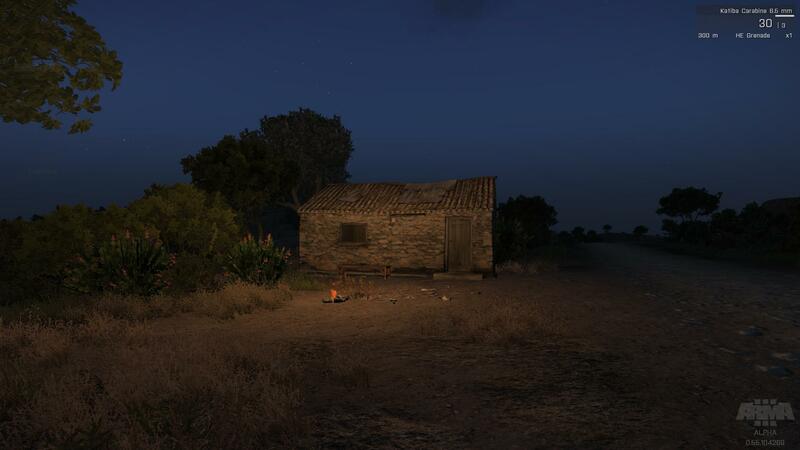 The new night lighting and sky texture/color palette looks good for a bright evening just after dawn. What happened to the flaslights? I assume they were retreated for maintenance? The detection of the Ifrit's lightglare textures is not accurate. When looking at it from the side, you will often find yourself seeing only one of them even though parts of the lights themselves are visible. This is not happening with the Hunter. The usual nights are too bright and stars are burning and blinding unrealistically. The gunner MFD's are unusable. The headlights for the Ifrit are way too bright. Take a look at this scene. It's taken at 00:00 hours with 100% overcast. Now this is with just a single Ifrit with lights on. 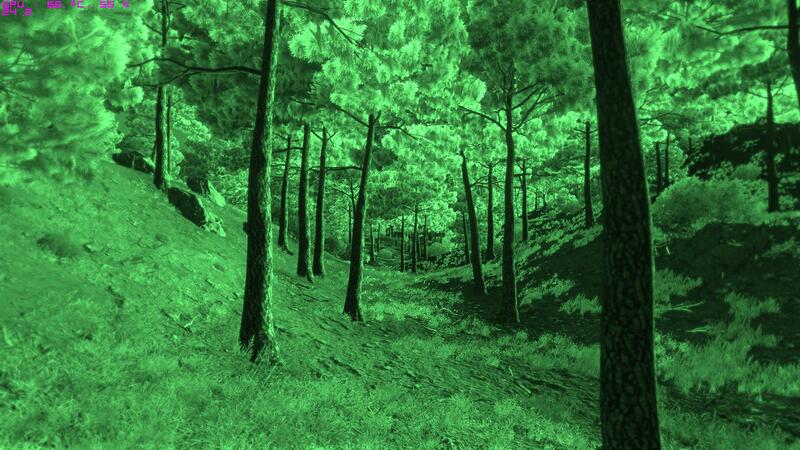 Note that the problem is extremely intensified because the light is not stopped by environmental geometry and goes right through it, resulting in extremely bright scenes even several hundred meters away with a hill in between. 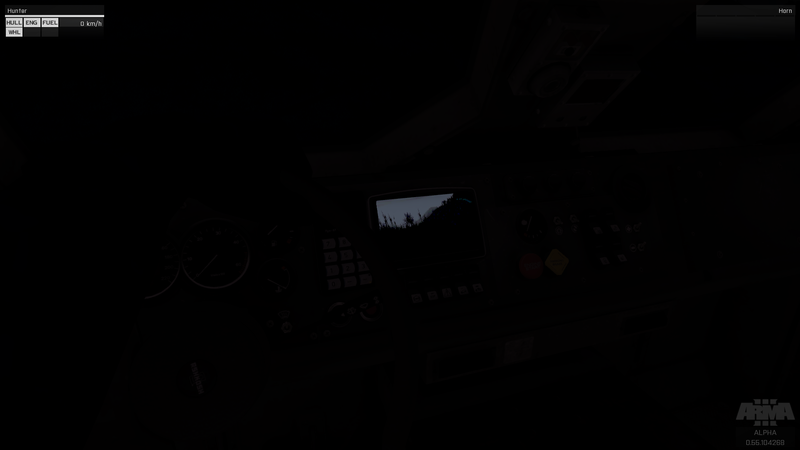 In comparison, this is the same scene with a Hunter vehicle with its lights on. Due to the fact that light passes through geometry, it is even moreso important to not make the lights too powerful. 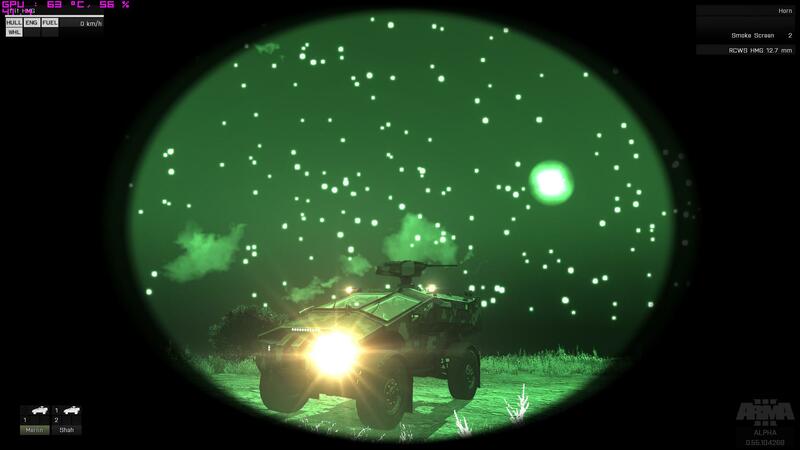 The ideal solution would be to slightly enhance the brightness and range of the Hunter's headlights and then incorporate those values to the other vehicles as the range from it seem very reasonable atm. As it is right now, the Ifrit should be changed asap! Since the sun changed in the latest build: Is the sun supposed to stay that way ? Because I can look into it without noticing any effect. Shouldn't the picture turn darker ? Same with coming from inside and going outside, you should be blinded by the bright light outside ? 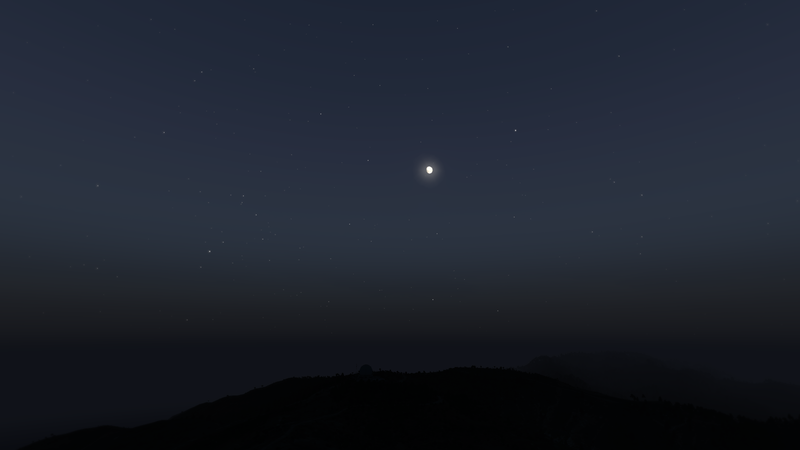 Jul 6 2035, 20:55, full overcast in Ifrit. It's close to how it should be in my opinion but still, night in such conditions should be pitch black. The detection of the Ifrit's lightglare textures are not accurate. When looking at it from the side, you will often find yourself seeing only one of them even though parts of the lights themselves are visible. This is not happening with the Hunter. 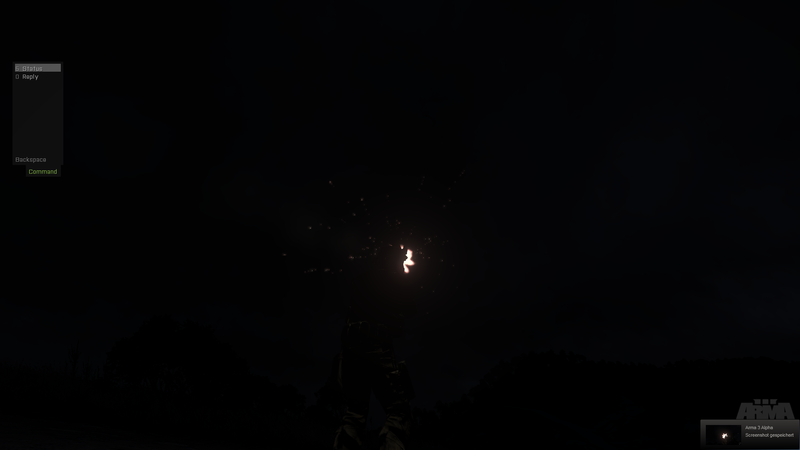 This seems to happen when running mods (for me I see it only when I'm running mods including midtex), when mods are not running the night is brighter than it should be, bluer than it should be, the dynamic lights don't render and the stars are non existant. 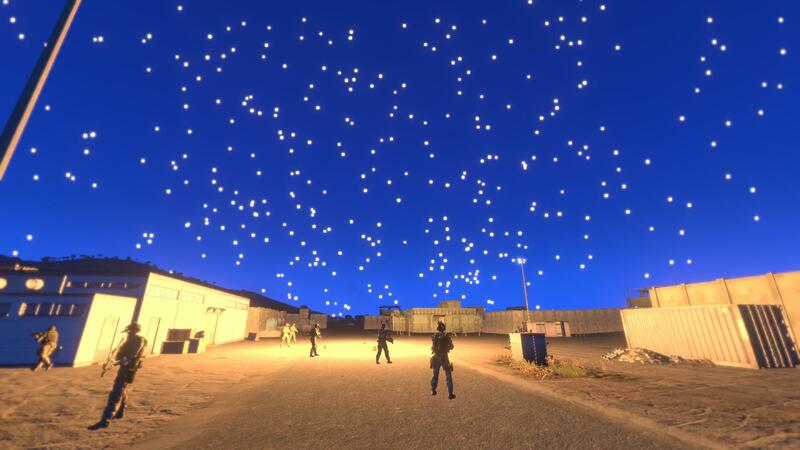 Ok, any editing of the game's landcape/environment texture files causes dynamic lights to be regular brightness, screws up the stars (ultra bright) and changes the sky's colour. Midtex is one such mod, I'm sure there are others (running Chernarus for example). I'll disable these and then test further, but if that's how nights are meant to look then night time is far too blue and bright. 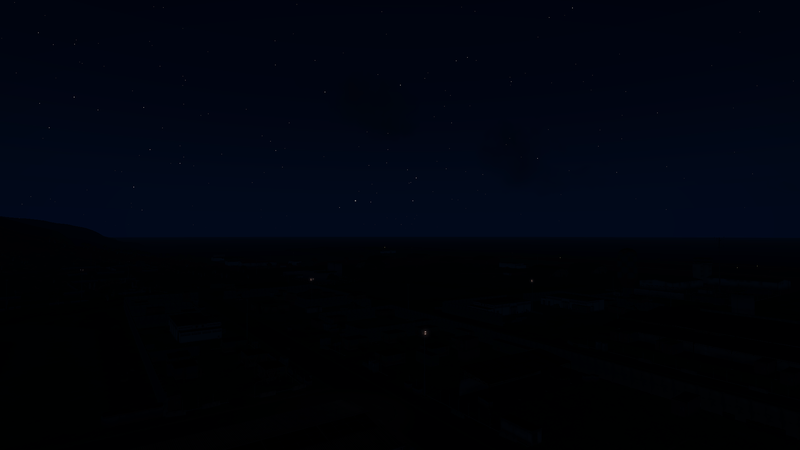 Yet another edit: Here's what my game looks like without mods: http://i.imgur.com/Y5ELM4Q.png That's the airport beneath me, the light from the static lights is there, but it's REALLY dim. 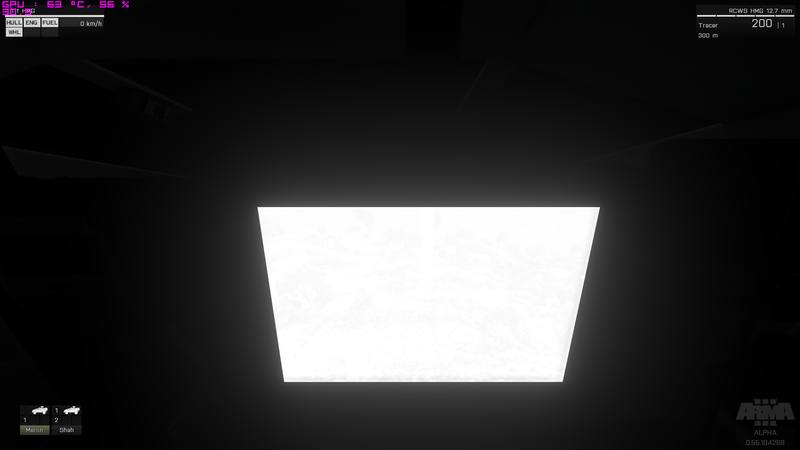 It will be invisible in screenshots, but if I adjust the aperture in the camera editor I can just see the light of it. Just a note: The colours there are all wrong, BIS needs to work on how the camera aperture works (and add shutter speed) and the colours of this game need a ton of work.